All of us in the NID community woke up to this news yesterday in India. One of the highest ever starting salary package was offered to an NID graduate Lalit Sawle, from the Retail Design faculty. Several things have changed since the un-named graduate in 2012 won a package of 38 lakhs in the placement, setting a record. ( See my earlier blog post here: http://wp.me/p1FfR3-2y ). For one, today’s placement is an offer from an Indian company ‘Trident’, as opposed to the Japanese company ‘ Toshiba’. This is not an isolated incident. Several others have also commanded very high salaries, above 22 lakhs and several of them, commanding even 48 lakhs as CTC. NID is still regarded as the ultimate source for quality design graduates, not withstanding several new institutions offering design programmes. This also reinforces the idea that NID is able to produce good graduates, despite issues and pressures from government and within. Faculty crunch, resource crunch, pressure to add more students, pressure to add more branches are only some of the issues that NID is busy battling. NID courses still have to stay relevant. The industry requirements and salaries cannot become the new pressure points to perform. And as has always been the case, the small inventor, the marginal student, the entrepreneurial and the socially relevant graduate should be celebrated as much as the high-salary commanding ones. This is what will continue to differentiate NID from the rest. It all happened in the course of the same week. I was invited a week ago to address a group of young design aspirants and anxious parents on the merits of choosing a career in design. There were so many who are exploring design as a serious career that it feels good. Not all of them, associate design with glamour. A lot of the hopeful candidates were quite aware about institutes and courses and were quite articulate as well in their queries. The same week, I had a concluding meeting with two bright girls who are doing a post-graduate course in Industrial design from SPA. 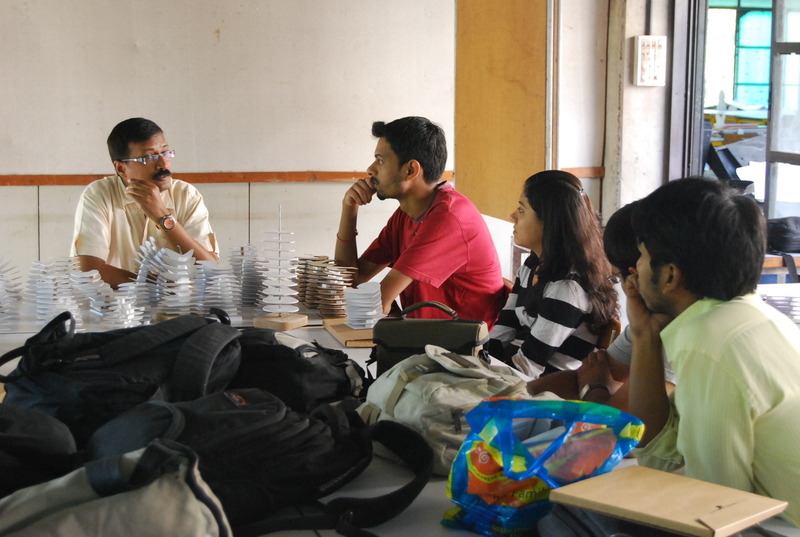 I was mentoring them for a project in craft design and they had come to show the results of a long assignment. They had traveled to craft clusters in North Indian villages on their own, dealt with artisans, spread the cause of design and had developed a series of product prototypes to demonstrate new and delightful design of craft products for urban use. Candidates or students, they are now an aware lot. Not the shy, unsure kind that was the hallmark of my generation. They are the new, in-your-face kind of change agents. They respect your thoughts but deal with nostalgia with the disdain it deserves. And they are not afraid of hard-work, either. This was confirmed in a visit I did to a small college in Indore that runs short-term design courses in fashion, graphics and web-design. All of them were from Indore and other small towns around it. With stars in their eyes, they hung on to every word I said and was convinced that effort is as important as creativity to become a good designer. They were all quite clear about their choice of career and were happy doing what they did. They were the new face of the emerging India. If this is the future of design students, then it is a very positive future for design as well. There is hope for a better, sensitive, sustainable world that this new generation will herald. They are equally eager to learn as well as teach. They are savvy with technology but have developed a respect for the old-school. They are strong in their agenda to bring about a refreshing new thinking that is both grounded and creative. This was re-inforced by another assignment I did. I was asked to evaluate a series of student portfolios for a client who was offering projects as internships to students of design. Student projects have moved on from designing nail-clippers to extension aids for making the disabled comfortable, products for public use that help sustain the environment, apps developed specifically for the elderly and medical products that saves lives. What a delight! This is so similar to the 1970’s, when designers came out of NID, ready to change the world. In an apparent reference to the dreamy-eyed designers, Kishore Biyani, the czar of retail, once commented in a design conference : “ Eighty percent of the design graduates want to get out and change the world….”. It seems like this number is growing and swelling. Aware design students have the unique capacity to influence thought and behaviour. They are also uniquely positioned to build the constituency for design awareness. The design constituency is growing real fast, thanks to these new generation change agents, it can soon become a beacon of hope for the resurgent India.